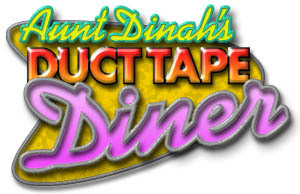 Got a Duct Tape Lover on your Holiday Gift List? Dad, Grandpa, Uncle Mike, brother (or any of the female equivilents to these relatives) will love a gift from the The Duct Tape Pro Shop as much as they love Duct Tape! Here's a cool web site, Zip Code Info zipskinny.com find out information about any zip code you type in. Theo Jansen: The Art of Creating Creatures - a TED Talk that deals with a guy that creates creatures that actually learn! Incredible! Deck the... EVERYTHING! 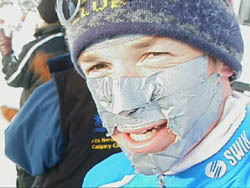 With Duct Tape! Make a lovely candle holder: Stick your pillar candles in rolls of duct tape with green and red duct tape holly leaves and berries attached around the perimeter of the roll. Or, make your own multi-wicked pillar candles by duct taping together a bunch of burned-down candle nubbins (usually found in the junk drawer). Speed holiday party clean-up duties by wrapping the feet of guests with duct tape, sticky-side-out, as they enter your house. All night long they will be picking up trash as they mill about. How about getting a bigger haul from Santa this year? Duct tape a dryer hose extention to the top of your stocking (shown in right column). Make your own Yule Logs out of old newspapers tightly rolled and bound with red and green duct tape. Where can you get colored duct tape? Look for Duck® brand tapes at your local hardware store, home improvement center, or at most Michael's craft stores coast to coast. And finally, nothing will assure that you get your share of holiday kissing like this clever invention (successfully implemented by Tim at last year's holiday party): A mistletoe holder. Duct tape a stick to your head with mistletoe duct taped to the end of the stick hanging about six to eight inches in front of your face. Get ready for some rapid-fire smoochin’! Duct Tape Guys to the Rescue! While we don't know the exact duct tape Christmas wreath directions that this guy’s referring to, we would simply wrap green duct tape around an old tire and add a big red duct tape bow. However, if you are a Martha Stewart wannabe (have WAY too much time on your hands), rip four hundred twelve-inch strips of green duct tape, fold them over onto themselves, and cut fringes in each side of the six-inch strips. Duct tape the four hundred fringed green duct tape strips around a hoola hoop, add a big red duct tape bow, and presto - there you have a charming duct tape Christmas wreath that will surely gather lots of positive comments from your holiday guests. Our hideous Holiday greeting card returns! When we sold our house in Connecticut, there was an interesting clause in the contract that was presented to us by the buyer's attorney - "Seller shall inform the Buyer of information that... the property contains or is believed to contain a spirit, ghost or other apparition." I kid you not, it actually said that. Well, I was a little concerned about this so I got the advice of a friend of mine who is a top notch New York lawyer. He told me to respond that I had never received written notice of the existence of any ghosts, spirits or apparitions. I think that was good advice. We went for pizza with a four year old friend of ours named Mouse. Her parents were not with us but apparently they had told her not to have any drinks containing sugar. When the waiter came to take her order she said, "I will have water because my parents are not here but I do have parents". When the waiter suggested that her parents would never find out she said, "I am obeying the law". I saw a pawn shop that was having a grand opening. How does that work? Does the owner just bring stuff from home? How did they make the first blacksmith's hammer? And finally, here is a helpful hint for living and this one could literally save your life. No matter how delicious they are and how good an idea it seems at the time. When you are stopping for lunch on a long car trip with your family, never, and by that I mean never, order the family sized roasted garlic appetizer. True story! This month I present two websites that were recommended by my lovely wife, Katie, who I married. Even though each and every idea she has and every suggestion she makes are worthy of publication, I will probably not do this every month so please make the most of this. Creative Quality Control. I was a quality control inspector for 16 years with General Dynamics Corp in Quincy, Ma. To beat the ship launch schedules we would DUCT TAPE all the plating seams above the waterline and paint them over to blend in, and it made the ship look good, then remove it later and weld them. - George L.
Bubba goes to the revival and listens to the preacher. After a while, the preacher asks anyone with needs to come forward and be prayed over. Bubba gets in line and when it's his turn the preacher says, "Bubba, what you want me to pray about?" Bubba says, "Preacher, I need you to pray for my hearing." So the preacher puts one finger in Bubba's ear and the other hand on top of his head and prays a while. After a few minutes, he removes his hands and says, "Bubba, how's your hearing now?" Bubba says, "I don't know preacher, it's not until next Wednesday." Some people are like Slinky’snot good for much of anything, but it sure brings a smile to your face when they are pushed down the stairs!